Heavy snow has trapped sheep across north Wales, leading to fears hundreds could die in the freezing conditions. The Farmers' Union of Wales (FAW) said farmers had their work cut out keeping the sheep they could still see alive, let alone trying to rescue others buried under drifts of 15ft (4.57m). One hill farmer in Conwy said his sheepdog had helped him find and rescue 70 ewes in the past two days. The unseasonable cold spell is forecast to continue until the weekend. Gareth Wyn Jones, who has 3,500 sheep at his farm in Llanfairfechan, Conwy, said after three days of work they had little hope of finding more animals alive. "The rescue job is coming to more of a salvage job. It's not very easy," he told the BBC News website. Mr Jones was full of praise for his seven-year-old sheepdog Eryri Cap, who he said was responsible for every rescue they had performed. Gwyn Williams, FUW area manager for Conwy, said: "There is no thaw in sight and people can't just move around either and see the entire farm because of the drifts. 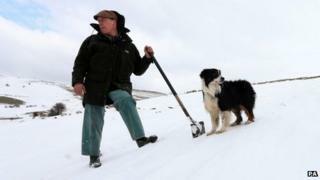 Media captionOne hill farmer in Conwy said his sheepdog had helped him find and rescue 70 ewes in the past two days. "They are 10-15ft in some place. Virtually the whole of north Wales is in the same boat." He said nobody would know the amount of sheep lost until they were able to get access to them. "Their work is cut out just trying to keep what they can see alive," he added. "The place looks different. You can't really imagine what it is without being there yourself. I have seen it with my own eyes." He said sheep could survive for weeks in the snow if necessary, especially if they were in groups as the immediate snow around them would melt and they would resort to eating each other's wool to stay alive. However, once they were rescued they tended not to survive for long after in his experience. Mr Williams said the worrying aspect was that the freeze had no prospect of an immediate end. "We can cope for two to three days, but anything longer than that we can't manage." At present he had not heard many reports of problems with feed deliveries, but said that a few days more "would create some problems", and added that collecting milk could become difficult, which would leave farmers in the position of having to pour away their supplies.